The video was recorded by one of the logistics pilots. The fight is sped up but still lasts 10 minutes. The entire thing took about 25-30 minutes. Sunday night, to my surprise, I wound up participating in one of the fleets fights that everyone else had been soaking in all weekend. I had resigned myself to a combatless weekend. My activity tends to peak and dip because I work every other weekend which has the side effect of missing half of the scheduled ops. This one was organic, and the organic ones are often the best. Diz had taken Naoru, LR, and Fried out in a kiting Omen gang. They wandered into Rise of Legion and Noir. having a fleet out. Maybe it was their normal gatecamp. I'm not sure. Diz called to us and we started to form up a response. The goal was to get a fight and that is often up in the air. We changed up our tactics this time. Instead of just diving into them and pushing we decided to match tactic with tactic. We brought a stack of Guardians. I commented the other day that we have logistic power. We do. What started as a 5 man response team rapidly increased. We were going up against a battleship and battlecruiser fleet supported by four Guardians. 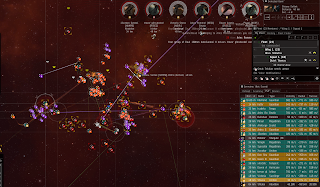 We responded with a T2 and Faction armor cruiser fleet to compliment Diz's kiting Omen fleet, a Falcon and three guardians. We managed to tack on a few more zealots and tap people on coms. Tilar poked her head in and was shoved into a Guardian and given a primer as we moved. Silver realized he had no armor heavy cruiser and grabbed a Guardian. Evel popped on, grabbed a Guardian and chased the fleet. By the time we reached Ennur we had five Guardians. Abnormal for us but this time, why not? As Diz tried to keep them interested we had word of a cruiser fleet with logi from Self Sabatoge in the area. We lost track of them, headed to Skarkon, and discovered that they were jumping into the fleet on the gate. it seems that it did not go well for them and they bailed. The bad part about bailing is that it sent their stragglers into us. This distracted them long enough to set up for us. There was some concern that they would leave and dock. It seems that earlier in the weekend there was a standoff where Noir. decided to dock up and take shuttles out of the system. That didn't work for them as well as they may have hoped because: Ueberlisk. However, they set up for us, Diz engaged them and the armor cruisers jumped in. I really love the people I fly with. Our two FCs merged seamlessly. 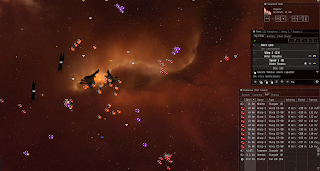 We had a kiting fleet, an armor cruiser fleet, and the logistic chain doing its thing. People shut up, orders were rolling rapid fire and everyone did what thy needed to do. It was an amazing experience. I love the feel of the focus. I was in a Stabber Fleet Issue. We engaged them and the fight went on and got messy quickly. ECM drones were everywhere and at one point our FC called us to clear all the EC drones off the field to stop our logistics from being jammed. Then, Rapier and with the Rapier came a cyno. For a moment, nothing came through, and then two Archons. Now we had four Guardians and two Archons on their side and five guardians on ours. The amount of logistics on the field was ridiculous. Things were being shot and dying very, very slowly. We killed the Rapier and the Armageddon from under the reps. At that point the carriers landed jams on the Guardians with their EC 900s. Our logistics chain had a bit of a break in it and during that time we started to lose ships. We lost two Zealot's in quick succession. Our hero Vexor died next. During this time one of our Dread pilots, using his cellphone as a hot spot, logged in and ran a Cyno down to the system. He accidentally offlined it, jumped back out to a station, on-lined it and came back. The ecm swarm was thinned down some and the Guardians stopped being jammed. Our falcon was swinging in and out delivering jams and running around in armor to far for the Guardians to rep. The support ships did an amazing job keeping ships alive under the fire power and switching their logistics chains at need. I was just trying to shoot things that would't die under all of the reps they were receiving. Dread pilots logged on and we hugged the carriers to keep them locked down. I went down around around 10-12 minutes into the fight. I docked at the first station I could, jump cloned to Isto, reshipped, and headed back down. However, I was eight jumps out. The cyno went up and our Dread pilots jumped in along with two people in Black Ops Battleships because they were late for the party. The other fleet decided to disengage. People were pointed and the Dreads got to blapping, and blapping, and blapping. I was one jump out when everything finished. I jumped into an empty field with a lot of stuff. We called in the haulers. Alts were logged in and we ran to clear the field. Lots and lots of fighters were left and the capitals had to be looted. 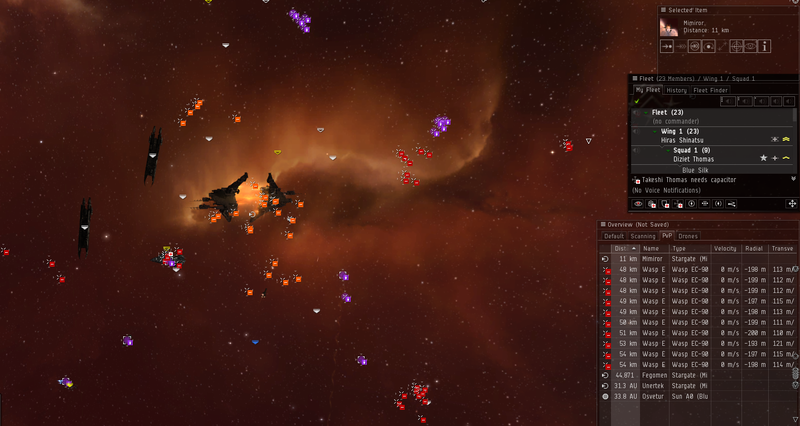 After about ten minutes of looting we had eyes on a fleet camping the Teon gate in Bosena. They had both sides camped. The FCs lost patience and left us to finish cleaning up the field and moved the fleet into position. Our Dread pilots and those that missed the fight had decided that they needed to fly Vindicators. 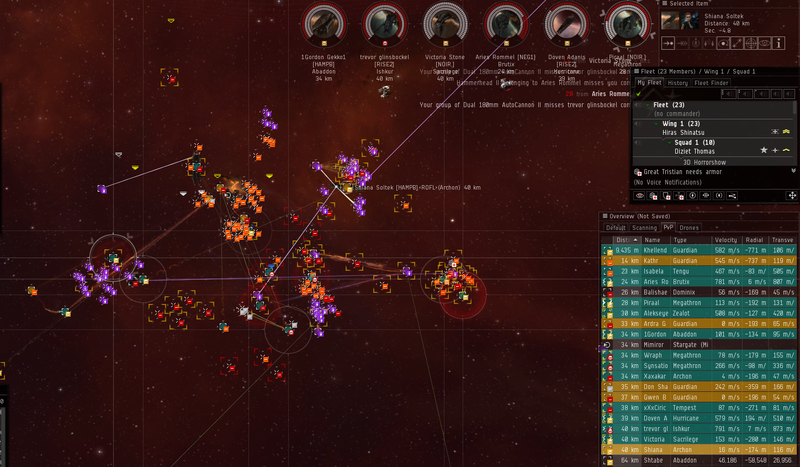 As we hit the Bosena gate our Vindicator bait undocked and warped to their fleet. They bit. We sent our fleet in. We were down to four Guardians and we took care of business. That was an interesting fight. The vindicators kept making my targets vanish and I thought I was losing point. One of the oddest things found later, was the armor Caracal. Beyond that, we lost nothing and took down one of their two Scorpions. They had them way off the field but we got one tackled and locked down. Glutted with the pewpew I staggered to bed. Van announced he had frapsed the fights and built the video embedded at the start of the post. I am no connoisseur of Eve videos but hopefully people will enjoy flying with us in it. The music he picked is electro-swing I believe? I've never heard of it but again I've never watched Eve videos to know what music is commonly picked. One of the biggest differences in this fight from many others I have been in was the amount of logistics we brought to the field. We did it because we were going up against a group who we rarely see with less than three logistics ships and I am not sure if I have ever seen them roam with none. I'm not used to that level of repair ability being spit out and its amazing how hard ships begin to be to kill under it. I was reminded of some of the high sec battles I read and the amount of logistics people bring to the field. It really changes the feel, speed, and flow of the fight. For those that love ISK efficency, despite our capital welps at the start of the month we've rebounded nicely and we are hovering just under a a hundred billion ISK destroyed this month. That sounds like an amazing fight and experiences like that I believe are what bring us back to this game over and over, not necessarily PVP but the camaraderie of people working together and doing things that while may be fun are also hard and taxing and pulling it off! It gives us a link in game that is not commonly matched outside of game. Of knowing that you made a difference in an event that was extremely cool to experience.